After 25 years in the sport card periodical business, the underrated price guide known as Tuff Stuff will release it's final issue in February. Tuff Stuff's parent company F+W Publications recently laid off four members of the sports editorial staff as a result of struggling sales and a decline in advertising revenue in recent years, which can largely be attributed to the continued growth of electronic media. During it's 25 year run, Tuff Stuff was considered the primary competition to Beckett's array of monthly sports card periodicals. 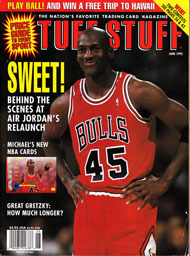 Tuff Stuff featured a glossy colored cover, a host of short articles and pricing for modern cards. In addition to the discontinuation of Tuff Stuff, F+W will cut back on the production of their other sports collector geared periodical known as Sports Collectors Digest. Instead of publishing 1 issue per week, the cut back will turn SCD into a bi-monthly magazine. SCD has been a weekly hobby staple since the late 80's sports card and memorabilia boom. 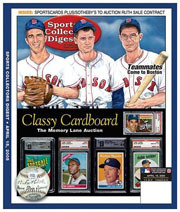 SCD's content is primarily geared toward vintage and old school sports card and memorabilia collectors. In light of the lay offs, Tom Bartsch will be retained by the company and will become full time editor for Sports Collectors Digest. In a written blog this week, Bartsch promised that some of Tuff Stuff's modern card coverage would be coming to SCD in coming months. “There will be more coverage of the modern-card market, including release information, product highlights and trends in the new-card hobby with insight into possible investment material," he wrote. " We will also have more pricing information, particularly on the autograph market, something SCD readers indicated they would like to see more of, along with more former player interviews, collector profiles and features on oddball memorabilia."